We kept the cleanness and simplicity of our UI, and we designed the new features with keeping the latest trends and needs in mind. Our new features include multi-layered backgrounds with effects, colored overlays, colour gradients, button styles and effects. Check out the full list of features below! 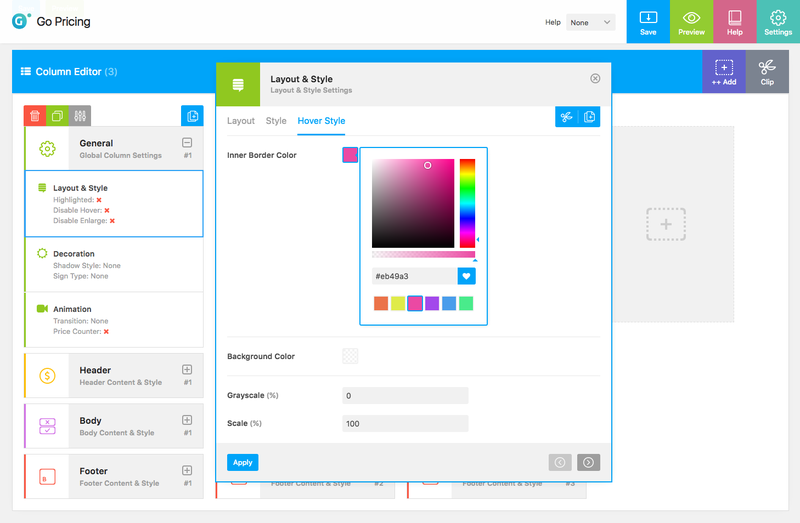 You can apply the Yet Skin to your existing tables, no need to start from scratch. Change the skin of the table and the new options will appear next to your existing ones. Also you can import any of the demo tables. Pressing deadline? Out of ideas? Don’t worry, we got you covered, we have created 85 demo tables that are ready to use or to inspire you! Check out all the demo data on this page: All Yet Samples. Check out Dedicated Samples page. The images used in the sample data are not included in the Add-on, but we can give some help on where to buy them! The Go Pricing plugin not included; must be purchased separately. 1. Can I use the Yet Skin if I only have the Go Pricing WordPress plugin? No, Yet Skin is an Add-on for Go Pricing that you need to purchase and install separately. 2. 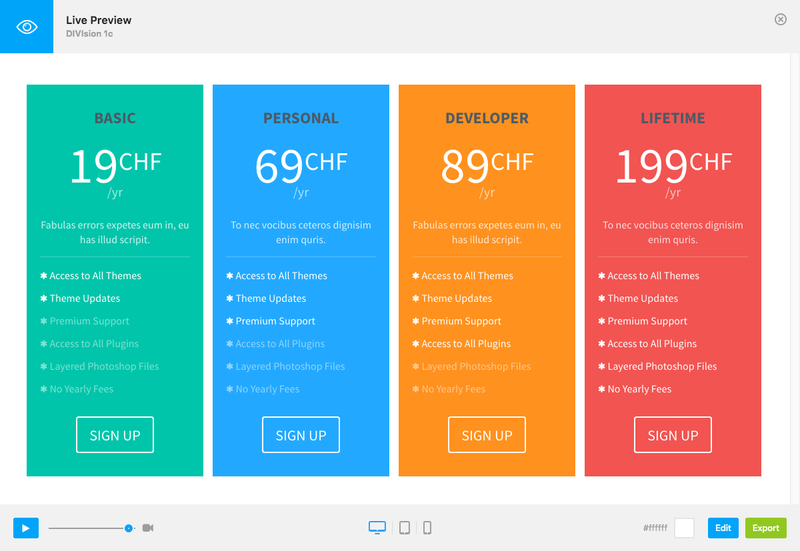 I got the Go Pricing plugin bundled with my theme, can I use Yet? Yes, you can use Yet with your Go Pricing plugin which is bundled with your theme. You should purchase and install separately. 3. I got the Go Pricing plugin bundled with my theme and I would like to buy Yet Add-on, but I have lower version of Go Pricing plugin than v3.3.2? 4. Can I apply Yet Skin to my existing table? Yes, you can change the skin of any table without content data loss. New skin specific options will appear in the admin after changing skins. 5. Can I switch back from Yet to Clean Skin? Yes, you can change the skin of any table without content data loss. Skin specific options are not visible when using different skin. 6. Can I modify the structure and/or the animation of an imported table? 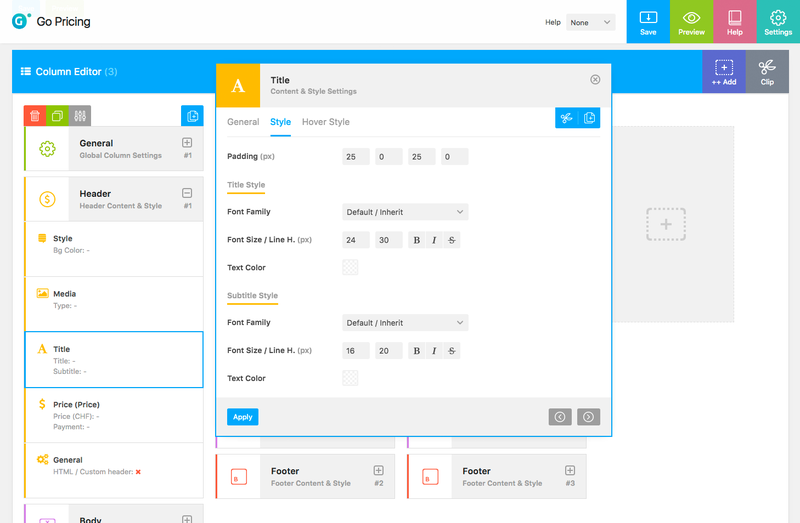 Yes, you can easily modify the number of columns and rows creating new ones, using clone or delete or sorting tools. Also, you can enable or disable animations or modify the column transitions. 7. Can I change the style of the buttons? 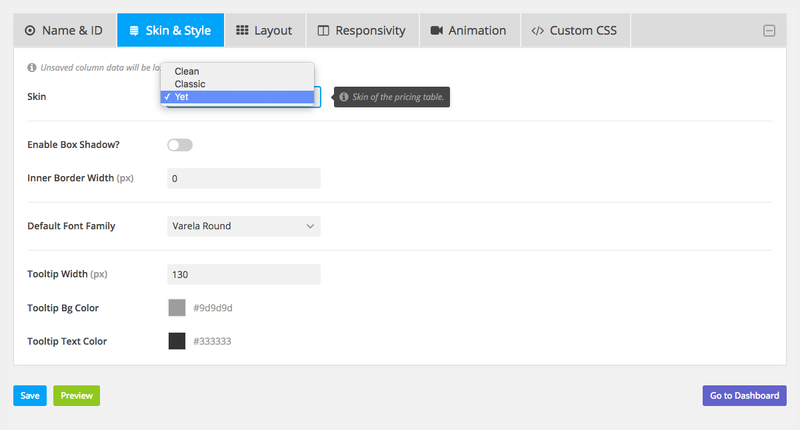 Yes, you can configure font settings, background, border and text colors and hover effects. 8. Can I set different background and text colors for the rows? 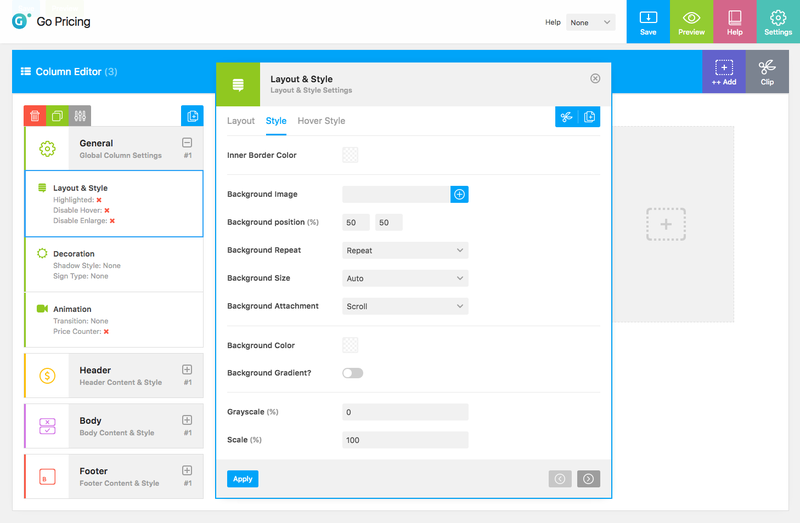 Yes, you have an option to set padding, row separator, background and text color for each row. 9. Can I set different colors for idle and hover state of a column? Yes, you have an option to set different idle and hover state colors of each part the column, including background, header, rows and buttons. You can find more questions and answers on the FAQ page. 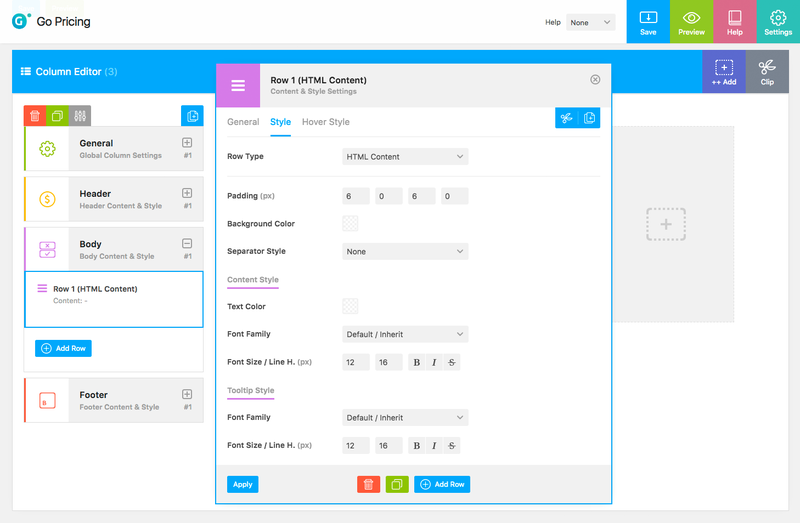 Our admin UI has not changed, the Add-on look and feel follows the familiar structures of the plugin. If you upgrade to Yet Skin you will have full access to the older features, you can continue where you have left off, no data loss, no interruption.